Durif doesn’t get much love. Or at least enough love. Certainly not enough given just how much flavour good Durif packs in – and often at a very fair price. This Durif serves a nice role then. 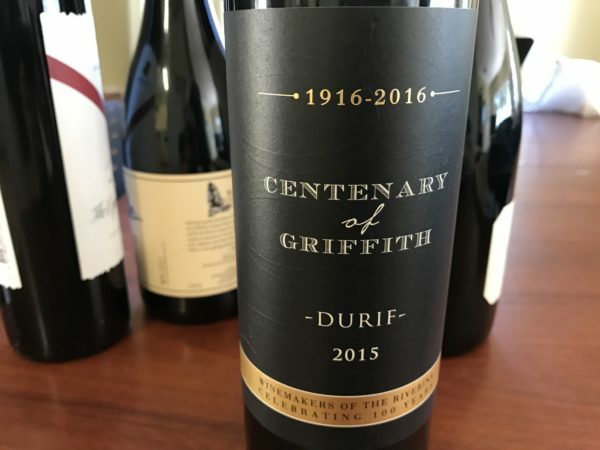 A collaborative release by the Riverina Winemakers Association that celebrates 100 years of Griffith (and Durif), this sees seven wineries contributing a barrel of their best Durif and then releasing a single wine. The wineries in question: Berton Vineyards, Calabria Family Wines, Casella Family Brands, De Bortoli Wines, McWilliams Wines, Nugan Estate, Warburn Estate. A typically luscious beast it is too. Bright deep purple with bright purple edges, it looks v. youthful. Luscious blackberry and mulberry nose is all fruit, with coffee oak a layer over the top. Of interest is how the combination of tannins and acidity hold back the flow of hearty, rough edged purple fruit, completed by a slightly sour edge. What I like here is just how much authentic coffeed cooked berry flavour it packs in. Ripe fruit at every turn, all blackness and power, if just a little tart, this has heart and character – plenty of ‘sunshine in a bottle’ fruit exuberance, if in an unpolished form. An admirable project and ultimately lots of wine for the dollars. Best drinking: 2018-2028. 17/20, 90/100. 14%, $20. Would I buy it? I’d love to see where this goes. A glass for now.